As we mentioned before, making money with Shopify by dropshipping products is one of the easiest and cheapest ways to run an online business that allows you to see faster results. Why? Because you don’t produce and fulfill anything; instead you focus on selling while the manufacturer/distributor does almost everything for you. Facebook, as a paid source of traffic, allows you to run ads immediately with a low budget to test. Once you sign up on Shopify and created your online store you may want to find the bestsellers of your niche to start testing your ads right away. Your job is to find a high demanded product, get it from a supplier at a very low cost and sell it on your own store with a higher price. 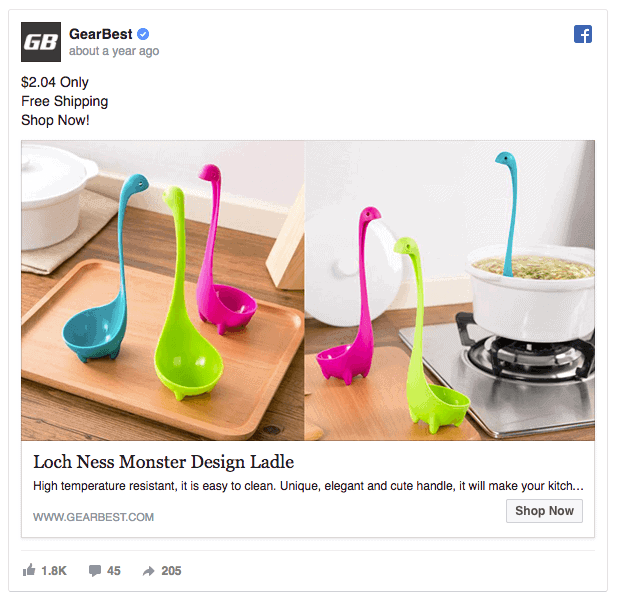 In this article we are covering how to find hot products that you can actually drop-ship and how can you advertise it with Facebook ads. Also, you’ll be learning about ad design and how to manage it in order to scale it or kill it when it is time. How to Find Products that Sell? Total Orders: The number of sales will tell you the popularity of a product compared to others on several sites. Price: Different prices can be found between sites, this way you can take this as a reference to set your own price. Product Details & Variations: You can see if the product has different variations like colors and sizes. The size of the product will determine the shipping cost. Variations can also affect costs and the way you advertise and showcase the product in your online store. Specific Terms are useful overall if you want to search the same product in other sites. Take in count the product title and description to use the correct keywords that define the product. The quality of the Product Pictures is important to promote it and advertise it. If you want to run a Drop-Shipping business, finding a seller that can provide an accurate picture of the product to promote it is key. Is important to know the most about the product you are selling to advertise it correctly and bring properly customer support, overall if you don’t see the product. Customer Reviews allows you to know the product quality and average appreciation of it. If a product has a huge amount of sales it will also have lots of reviews where you can find customer’s opinion and even photos of the delivered product. Shipping Cost & Delivery Time depends on the product size, weight and also on the supplier and the destination country. Seller Reputation & Guarantees: Seller reputation can be measured by its positive feedback of its products and their customer reviews rating. You better want to make contact with your supplier before the purchase, making sure that the response is fast and you get professional treatment. In the meanwhile, you can find Related Products in your niche that can be a good choice to promote too. 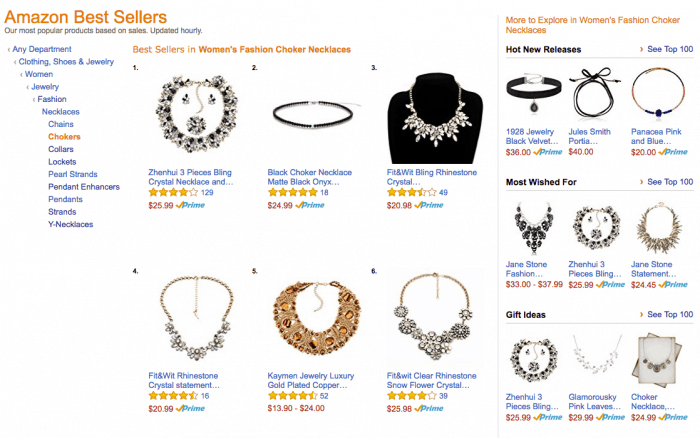 Amazon is one of the largest e-commerce sites that can throw valuable information about hot products. It is a useful tool to find best selling products for who is willing to drop-ship. Go to the Amazon Best Sellers Page which can also be found on google searching for the same term. Find a list of broad categories at the left side of the screen. Click on your desired niche and find the subcategories. These subcategories will lead you to more subcategories, making your search more specific. On every category, you’ll be shown the best sellers, which will be changing every time you narrow your search. This process will make you realize that for some categories there are several subcategories which are very different in content. You’ll find several products you may haven’t think of that can be drop-shipped. Analyze the best selling products of different categories in your desired niche taking in count the factors mentioned before. This category shows you some results but surprisingly not what I was looking for. As a girl, I know which kind of chokers are trending right now, so I had to dig into other categories. 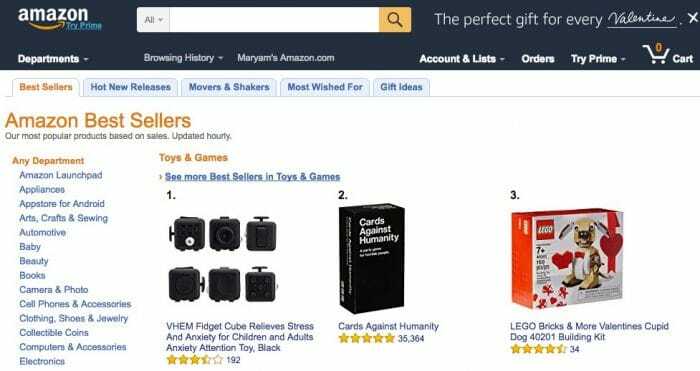 For this reason, I realized that there is another method to find best sellers in similar categories. I’ve found that digging into categories is not always the best way to find the products you are searching for. Searching for products I’ve found that typing the keywords in the searching field will throw you product results where you can easily find the “Best Seller” orange badge on some of them. And if you hover over the badge, the exact category of which this particular product is the best seller will be shown as a link. Opening that category will reveal you a new list of related products. Also, you can find the sub-categories on the left sidebar that are related to this particular search. 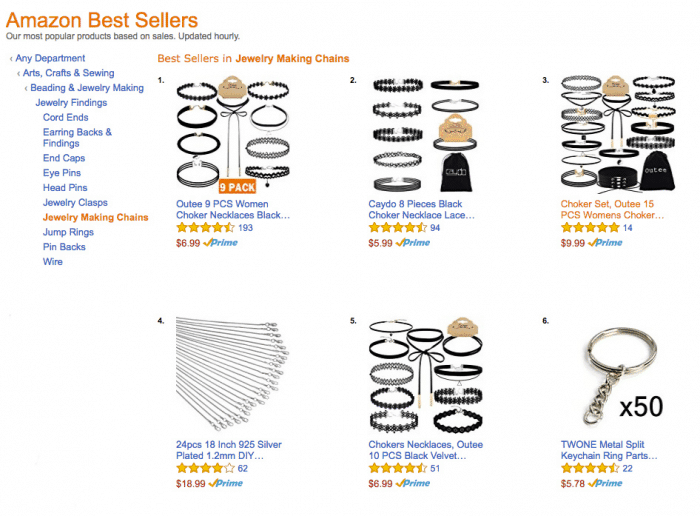 I’ve found that the black chokers are listed as best sellers in several categories like “Jewelry Making Chains” and also the “Jewelry Making Charms” which belongs to the “Arts, Crafts & Sewing” main category. These popular chokers are also a best seller in the “Novelty Necklaces” that belong to the “Clothing, Shoes & Jewelry” main category, which I’ve found more related to the product at first. Amazon shows you some best sellers related to your keyword search because the results are sorted by relevance by default. This can be managed at the “Sort by” menu at the top of your product search results. 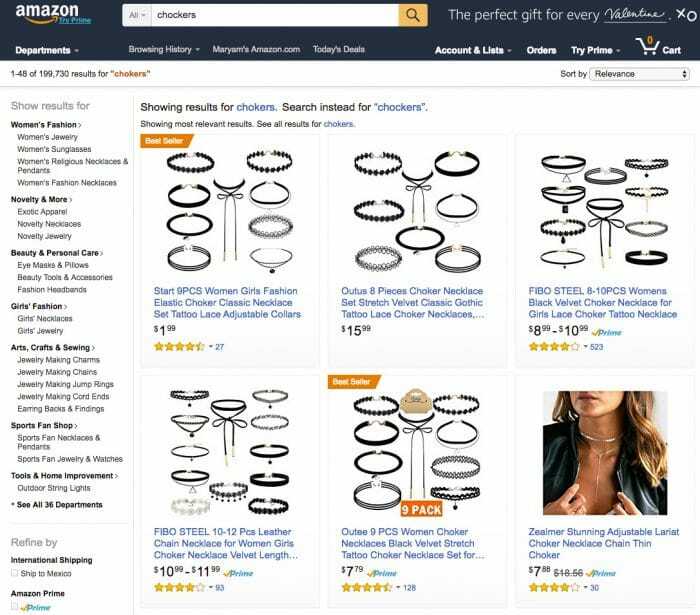 As you can see Amazon is a great reference site to make a list of different products that can be drop-shipped, which leads us to the next step: find a supplier for this product at a lower price. 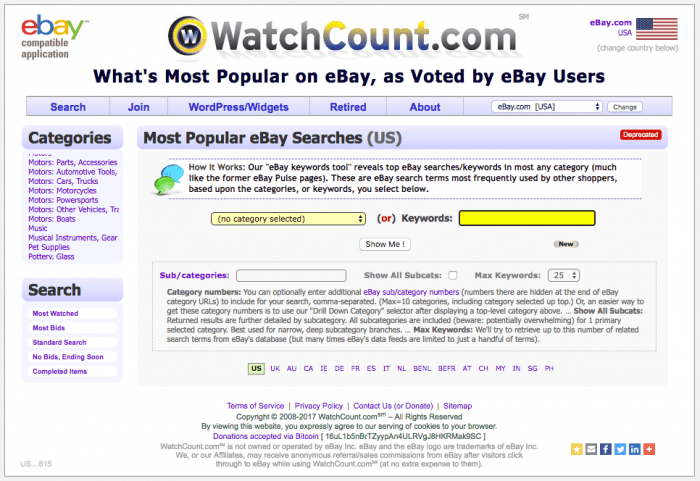 WatchCount is an online tool that allows you to find the top searches on eBay though the Most Popular eBay Searches Tool in real time. If you type a specific keyword you can find related searches and alternatives. Click “Show Me!” to get results. Notice that in the main menu, there is a drop-down menu where you can select the country. It is helpful to get information if you are seeking the results of a specific country and specific language. (There are only a few countries to try.) The country can also be changed clicking on the country abbreviations shown below the searching fields. You can also select the number of results shown by search by selecting the number in the drop-down menu “Max. Keywords“. This is helpful when searching by subcategory. 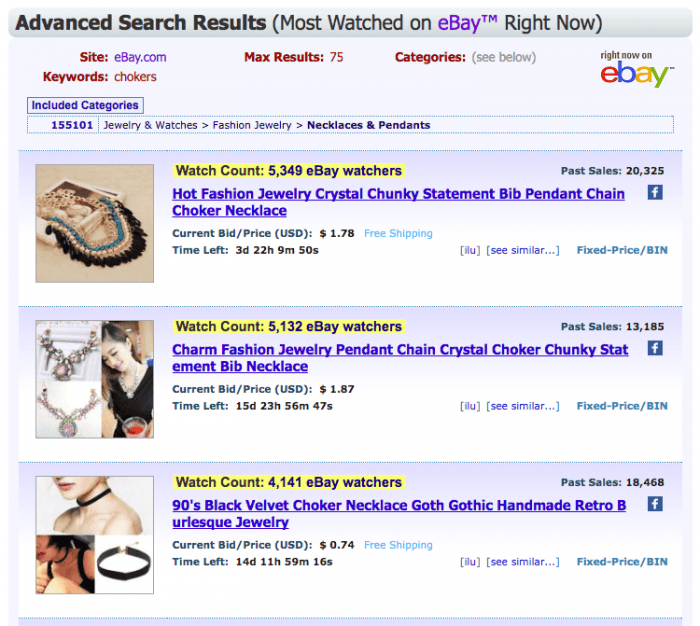 Watchcount gives you the top searches on eBay related to the keyword “chokers“. This way, you get information about the product you want to sell and related products that are very popular. Searching products by category is another way to find popular products on WatchCount. But first you have to find the category number of a specific category. Open a product page, whatever it is. Go to eBay and make a search. Find the subcategory below the search field after “Listed in category”. The subcategory where this specific product is listed is shown at the end of all the subcategories. Click on the last subcategory. In the picture, you can see “Necklaces & Pendants” as the last subcategory. Find the category number in the search field where the actual URL is shown. The number is among dashes. Select the Category on the menu. Type the category number on the “Sub/categories” field. Check the “Show all Subcats” box. Click on “Show Me!” to get results. This way, you get the top searches of a particular category and you can also get each subcategory results. 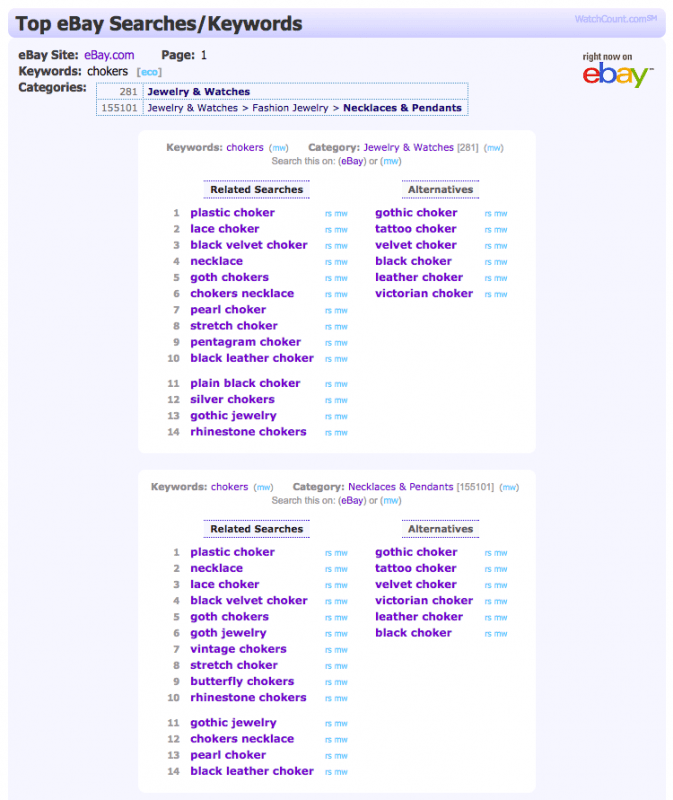 As you can see, this results shows us that the “plastic choker” is the most popular product related to the keyword “chokers“. It also shows other specific results that can be very useful to decide which products to include in your store. Now it’s time to make use of the Most Watched Search Tool. 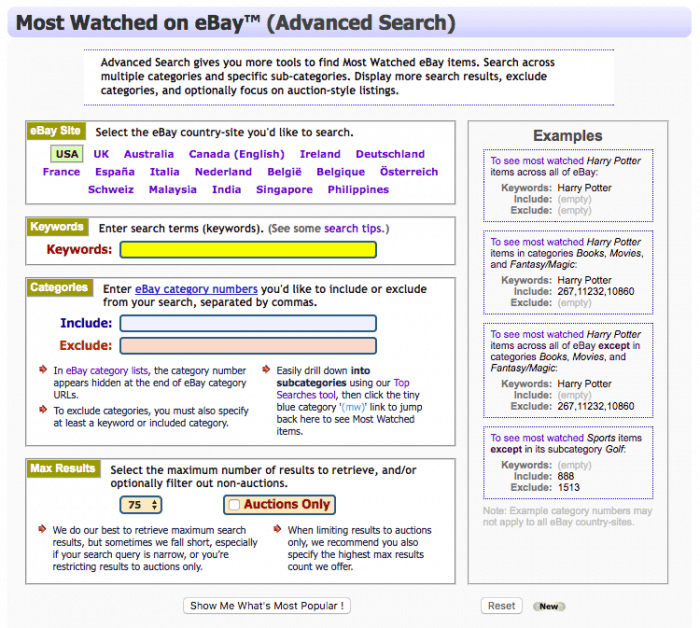 This tool allows you to search the most watched items on eBay by keyword and category. Open it and notice there are three text fields “Keywords“, “Include” and “Exclude“. To search by category put the category or subcategory number using the “Include” field, you can add more than one category number separated by a comma. You can also exclude a specific category typing the category number in the “Exclude” field. Make a search with the desired keyword and also paste in the “Include” field the number of the subcategory of the product. You can also make a broad search without including categories. You’ll be shown interesting results that will help you to decide which product to sell. When the results are listed you’ll find the “Watch Count” with a yellow background which shows the popularity of the product. On the other hand, you can see the total sales of this particular product at the right in “Past Sales“. As the results are listed by popularity and not for sales, you’ll find that some other similar products have similar sale numbers with less “watchers“. As you can see, you can get very useful information from eBay. You can find related products with popularity and trends related to your niche. You can also find which is the most popular product in your niche. We continue to search for products but now on Aliexpress. 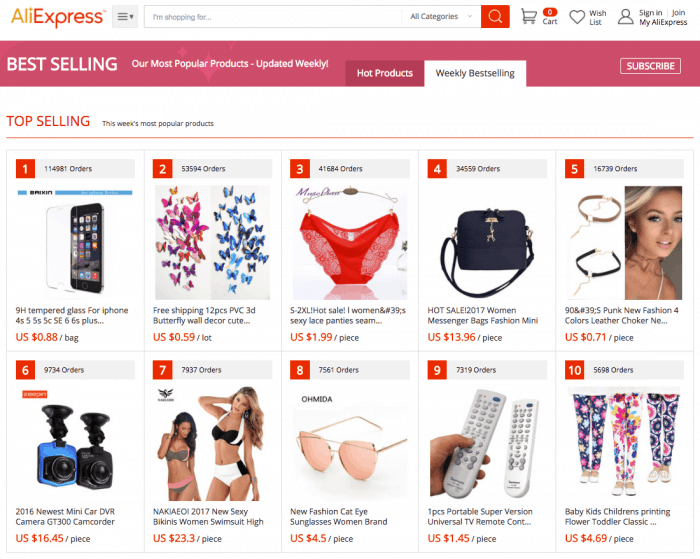 If you visit the Aliexpress Best Selling Page, you’ll find that you can find the best selling products of the current week which are listed by categories below the top selling products. The number of sales is shown next to the ranking number of each product. Taking in count the specific terms and keywords of a particular product, make a search on Aliexpress. Using our previous example, if we search for “chokers” we will find interesting results. First, sort your results by “Orders“. This will show you the top selling products. Below the product name, there is a customer review rating and the number of total sales of the product. As you can see Aliexpress manages a huge amount of sales of one product in particular. The most appealing fact is the price, which is way lower than the prices we saw listed on Amazon. 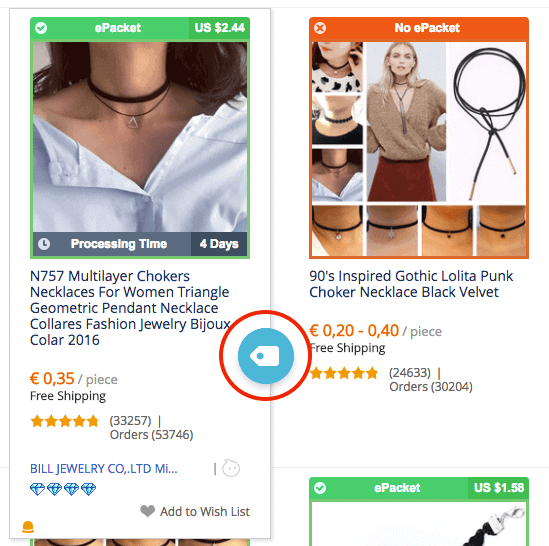 As we mentioned in the recent article about how can you automatically import products from AliExpress with Oberlo, you’ll find this familiar. The badge around the product pictures indicates if the product is shipped through “ePacket“, which can be switched with different delivery services. Shipping information like delivery companies, currency and processing times can be customized with the Oberlo extension for Google Chrome. 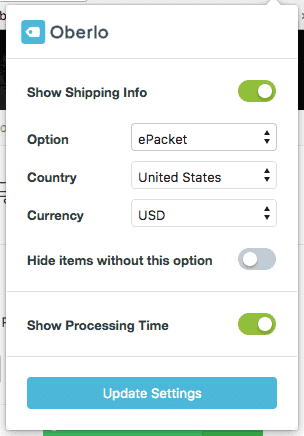 If you click the blue tag that appears when you pass the cursor over a product, the Oberlo importer, you’ll automatically import this product to your Shopify Store. As you can notice, Aliexpress can provide a large variety of products seen on Amazon with very low prices. You may notice that even the same product pictures are listed in both e-commerce stores. That’s why Amazon can be a good price reference for beginners. Now that you have found at least one interesting product to drop-ship, its time to promote it with Facebook Ads. At this point, you sure are very motivated to start right away advertising your products and if you haven’t yet you may want to Create your Shopify Store as soon as possible! We’ve mentioned before that the best traffic source to promote products is Facebook Ads because it is cheap, easier and you are able to target very specific audiences. It provides you the tools you need to personally launch ad campaigns and get all the performance results. When you are able to measure and compare the performance of different ads, you can identify which ad works better with an audience. That’s why Facebook ads is a great source of paid traffic for beginners because you can compare your ads performance with a low budget. There are better types of Facebook Ads to sell products than others. The objectives of these ads tell us the function it performs. 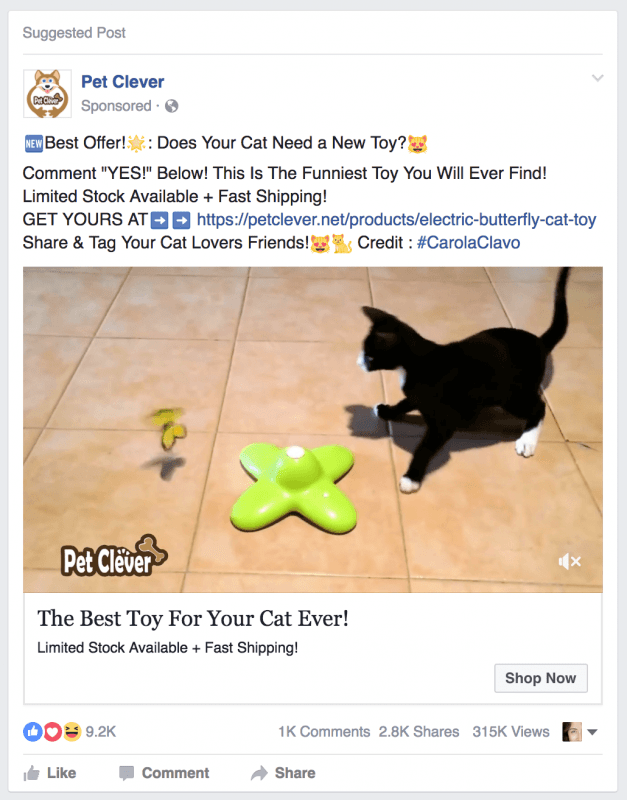 For e-Commerce, there are some types of Facebook ads to test to promote products in order to find out which of those outperforms the others. 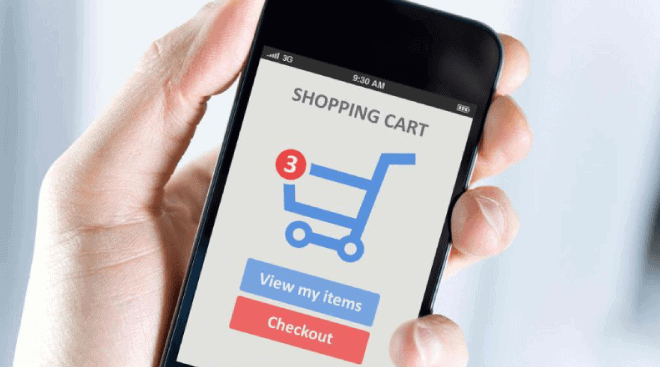 The main goal on e-Commerce is to drive your hooked audience to your product page in order to encourage them to check out. To achieve this, “Clicks to Website” and “Website Conversions” are the type of Facebook ads that can drive your audience directly to your online store because almost all the ad is a link to a specific URL. In these particular types of Facebook Ads, the ad image and the headline is a clickable area. There is always the option to add a “Call to Action” button next to the headline to get even more clicks. Some advertisers take advantage of the text area above the ad image to add a link with a call to action to incite people to click. But the main difference is that with “Clicks to Website” Facebook optimizes for as many clicks as possible and for “Website Conversions” Facebook optimizes for as many conversions as possible. Facebook requires time to optimize ads for better results, that is why is important to run your ads for a certain period of time to start getting better results with the same budget. On the other hand, we have the “Page Post Engagement” ad type that looks exactly like a Facebook Post commonly with a picture or video. The goal of this ad is not mainly to drive traffic to your online store but to reach a huge amount of people in order to create a lot of engagement around a particular product. It is expected to receive a lot of likes, shares and comments asking how to get your product, and for this is useful to add a link to your product page in the text area above the picture and even in the first comment. It is also expected that a PPE ad with a link reaches fewer people. As a sponsored post with lots of engagement, your audience will be also hooked by the popularity of your product., which makes it look more appealing. There is always doubt about how to target an audience correctly, what most people should understand is that advertisers manage to target their audiences using different methods and they end finding some practices that work better for some niches and products than others. On Facebook, there is always a start point: demographics. It is easy to have an idea of the type of audience of a particular niche. Gender is something we can easily determine most times. Location and language are determined by the country you are willing to send products. Age range is something that can be targeted broadly at the beginning. People inside this type of audiences are the most willing to spend money and that’s why we should target them at first. As mentioned before, a successful ad campaign is the result of testing a lot and it also applies to ad design. Visually, there are some elements that can be customized in order to catch your audience attention and incite them to click and to complete the process of purchasing. Image Resolution & Quality: In order to make your ad look professional you have to use the correct resolution and quality in your images. You can check which is the correct resolution for each of the Types of Facebook Ads here. Concept: Is the theme of your ad, you can define two or more concepts related to your product to test at first. The goal is to find a concept that works better compared to others. Concepts should be different in order to test each ad design effectiveness. The goal is to run a low-budget campaign with different concepts to find a winner. Then, it’s time to test different design variations of the same concept in order to find which added elements (Text, Symbols, Design Elements, Frames, etc) have a better performance. Text Over Image: It’s a common practice to put a discount number or code next to the product. It also applies to add a sense of urgency like “SALE” or “FREE“. As mentioned several times in other articles, Facebook measures the amount of text over your ad images to set the exposure level it will get. Basically the more text the less exposure your ad will get. But there is an amount of text allowed for your ad to run normally.You can check your ad image text rating with the Text Overlay Tool. Ribbons & Frames to highlight Text. Images of different perspectives or colors of the product. Call to Action (“Click here“, “Shop Now“) Buttons. Image Frame: If you put a red or yellow frame around your image you can increase your CTR. You can also find some lines and geometric figures that easily catch your attention and put your eyes on an ad like the “Now This” ad below. Product only vs People using the product: You can find that some coaches and internet articles tell you to put a product focused image while others tell you that actually what really works for them is the opposite. When you showcase your product in an appealing environment with people being happy and satisfied using it, you are not only showing your product features but also the benefits they get with it, which means expressing an emotional message related to the product. Even videos are used to show people making use of the products in a creative way and work very well for some advertisers. That’s why this should be tested in both ways to get the results of your product in particular. The Ad Copy is the text in different placements of your ad that can help your ad image to communicate a specific message to your audience. For Facebook Ad Types like Clicks to Website or Website Conversions you can write a text above the ad image and a headline below; while using Page Post Engagement allows you to write more text above the ad image which is way bigger. It is crucial that advertisers like you make a simple short message that encourages people to click the ad. With this in mind and with a limited number of characters allowed on the ad copy, there is only room for a few important words. When an ad manages to hook a potential customer, you must convince him to give a step closer to the sale process: Click the add that drives him/her to your product page. This is where CTA(Call to action) comes into play. A “Call to Action” text can definitively increase the number of hooked users that click the ad. Making use of the right expressions you can communicate a message that can be specified through the ad image. Click to Get FREE Shipping Here! Tip: Include emojis to catch the attention of your audience directly to the text. Bets practices are placing emojis at the beginning, at the end of a text or link or both. Adding a sense of urgency in your ads is key to hook your audience. It is an old practice that has always worked and that can be implemented in different ways. FREE Sample/Product, just pay for shipping! As you can see, there is plenty of words and numbers you can use to communicate a sense of urgency in your ads campaigns. When you have your targeting done, set a low budget to start collecting valuable information about the audience that really cares about your products. Run your ad for about 3-5 days. Is recommended to start from 10 to 20 USD per day for beginners. A common practice is to split age ranges and placements (desktop or mobile) after this (check your Facebook Ads Reports). This allows you to drop what is not working for you and keep running ads with better results for a longer period of time(about 7 days). Some people may consider a waste of money to run an ad with low conversions, but it is definitely worth it to learn about the audience that is willing to buy your products. Your ad statistics will allow you to make a better targeting in your next campaigns and here is when you raise your budget (duplicate ad-sets with higher budgets) to the next level and let your ads run for another week. Remember, start low and raise your budget after getting information yo make smarter choices about targeting your audience. But it is a frequent question coming from beginners: When to kill an add? There is actually no specific formula for this but there are some strong indicators that can tell you when to kill ads. As we mentioned above, the reason to let your ads run for several days allows you to realize if the add is getting results and Facebook takes time to optimize it for conversions. One day for an ad is a very short period of time to decide to kill it. Let it run and then analyze your results. If your ad doesn’t get sales and a little bit of profit after some days, its time to kill it (e.g. Ad spent $40-60 for a product that costs $10 and didn’t get a sale after 3 days, then kill it). From now own, as an advertiser you have to adopt a different mindset about how advertising works and how money and Facebook Ads also work for you. It’s crucial to test a lot, and learn about your winner campaigns and mostly your bad campaigns. It’s true that you can find coaching running facebook ads, but at the end, you’ll find yourself testing your own ads for your own products in the future and the only valuable information you’ll get is from your own add statistics. Every niche and every product are different and you have to learn how to advertise it in the best way possible. Is there a way to find the ads for products on Facebook? If we search in facebook it will NOT return the dark posts and now a days almost all of the ads are dark posts. In this case you’d need to use a facebook spy tool. I don’t really have one to recommend at the moment but there are many and Facebook constantly take them down. I still need help as I have made and launched my store 2 weeks ago but I have not made a single sales. I have done FB marketing but no sales. I do not know what I am missing. Are you testing many products or just 1? If so, how much are you spending on ads per day and what’s the average profit you expect to get per product? Thank you for the wonderful suggestions, one way that I found it also helps me as Google trends to test how many searches are on my product before even creating an ad. Thanks for the wonderful post, if i may ask. Whats the best way if im in Asia and i target the US. My products will come from Aliexpress, isnt it better to have a virtual address in the US to add more credibility? You don’t require it but if you can have an address there and have your own inventory it would be a competitive advantage. In that case you probably don’t need anything like that to be honest. Start selling and after getting sales and understanding your market then proceed to get those extras. You did a lot of effort to write this, continue. My biggest concern is when I have found a product I want to sell, where do I source it from ? or do I dropship it from Aliexpress. The thing that worries me is the shipping times. I have spend months trying to get my paypal account not to have the money hold. And having disputes from the long shipping time will that not cause any problems ? Yes, sometimes they have problems so the best thing you need to do is to always show the shipping times in your site and if somebody complains just refund the money to avoid getting your PayPal account frozen. You can initially drop ship things from Aliexpress, but once you start doing some volume you want to buy them and have stock and inventory yourself so you can ship fast within the country you’re selling. I do not live in the countries that I sell the items too. This is really a headache. I have sold about 20 items in the last week from aliexpress and it is already starting I have to spend so much time explaining to clients that items is shipped it takes 5-10 day’s for the tracking details to start showing on the tracking website. Its just crazy how they start threatening about disputes on paypal etc. Its just fires and more fires from the day they ordered. I need to cross this bridge before I can feel satisfied with what Im doing. Im sure I will be able to sell 100s of products from aliexpress if I can just get this problem of shipping resolved. Somethin that helps is that, if you notify your customers about the shipping time from the beginning it helps to reduce the complaints and it also helps if you offer a good customer service. Maybe I should just send out an email as soon as the client paid for their order. Then the email could explain something like we ran out of stock and item will be shipped directly from one of our partners and as soon as it is shipped I will send them the tracking number and the tracking number will be trackable online within 5 – 10 day’s and the product will be delivered anything from 12 – 60 day’s depending on their location ?